Single-stage compressors are available in 2-5 horsepower (HP). Your air requirements will dictate how much HP you will need to effectively utilize your compressor. While a 5 HP compressor isn't necessarily better than a 2 HP model, the extra power does mean you can create more CFM. This will allow you to run more heavy-duty air tools or multiple air tools at once. Make sure the compressor you select can produce enough CFM to run the tools in your arsenal. For single stage compressors there are three voltage options: 120/240v, 208-230v or 230v. The most important factor in your decision will be what type of electricity you are already wired for. Standard homes have 120/240v wiring. Choosing a compressor with this capability will be easiest because you will not have to install any new electrical wiring. If you don't already have 208 or 230v wiring installed in your home or garage, you'll need an electrician to set it up to support the higher voltage. The pump on a compressor is arguably the most important piece of the machine, as it keeps it humming and pumping out compressed air. If the pump isn't designed for the application you are using it for, it can overheat and die. To prevent this look for a single-stage compressor with a V-design pump. This style will minimize vibration, improve cooling and subsequently extend the life of your compressor. Looking for ways to treat your compressed air? Whether you're using your compressor for applying a smooth coat of paint to an automobile or using it for powering air tools, air treatment is an important part of doing the job right. Removing water and contaminants from your compressed air can prolong the life of your air tools and keep your paints clean and dry so they apply more smoothly. 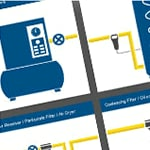 Browse our virtual air treatment guide for ideas on how you can improve the quality of your compressed air. Stationary Single-Stage Compressor Buyer's Guide - Find Out How to Pick the Perfect Single-Stage Compressor. Our air compressor how-to library can help you pick the perfect single-stage air compressor, two-stage air compressor, rotary screw air compressor, air tool, or air compressor accessory.